I don’t normally like to speak in superlatives when it comes to Android devices because it often angers a person or two. Calling something the best or worst of anything is an easy way to invite confrontation. Unfortunately, that’s exactly what I have to do here with the Samsung Galaxy S II for T-Mobile. Why? Because, simply put, this is easily one of the best Android phones I have ever seen hit the carrier’s network. Takeaway: If you want cutting edge hardware and access to T-Mobile’s crazy fast 4G network then Samsung Galaxy S II is on a very short list. You’ll pay a premium for this tech but it should last you quite a while. After the problems with the Vibrant, a chief concern of ours is how quickly the next update (Android 4.0) happens. [dropcap_1] F [/dropcap_1] rom the moment you power on the Galaxy S II it becomes obvious that this phone is not joking around. As a matter of fact, I might argue that you get this sense upon opening the box. One look and you know this phone is the perfect blend of beauty, class, and sophistication. In an age where it’s easy to phone in (pun intended) a slate, touch-only smartphone, the Galaxy S II pays attention to details. I really dig the back of the device an the chrome bezel as they add a touch of elegance to the phone and beg for attention. I could go on and on about benchmarks, litmus tests, and all that real technical stuff but I won’t bore you average consumer types. The Samsung Galaxy S II is fast, real fast. I’m reminded of the difference in performance of my first Snapdragon experience after spending all my time with a 528MHz-powered G1. It’s a night-and-day difference from many of the phones I’ve had the opportunity to use and I suspect you’d say the same. Swiping from screen to screen, opening apps, installing apps, changing wallpapers, tweaking fonts, and notifications – all the everyday stuff? It’s blazing. Again, much could be said about the display size and technology but I will break it down simple for you. It’s massive without feeling like a giant slab in your hand. Remember how big that EVO 4G felt the first time you picked it up? This ain’t that. The Super AMOLED Plus display is vibrant, clean, and a real joy for reading emails and text messages. 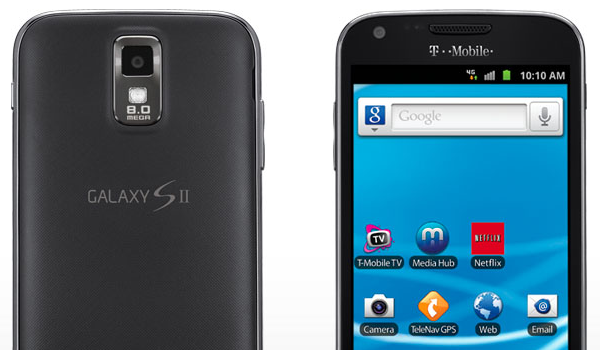 As a successor to the T-Mobile Vibrant, the Samsung Galaxy S II is quite stunning to behold. The soft-touch finish on back side not only makes the battery door stick to your hands although not quite as much as its Sprint counterpart, but it looks sharp with the chrome-like accents around the edge. At 5.11 inches tall and 2.71 inches wide, the phone is somewhat cumbersome to hold when making calls. The thin design, however, makes for a more enjoyable experience than the EVO 4G or other thicker 4.0″+ phones. The Galaxy S II is very light in hand and fits quite nicely in pockets and feels “all display” when playing with it. There’s not much I can say about the Super AMOLED Plus display that can convey how beautiful it truly looks. It’s one of those “you just have to see it to understand it” scenarios. Sharp, vibrant, spacious, bright, and responsive are all adjectives that come to mind when spending time with the Galaxy S II. Coincidentally these were terms I would have used on last year’s models of Super AMOLED products. Today’s Plus stuff just happens to be that much better. I would have loved to see something in line with the qHD (960×540) or HD (1280X720) display technology but this is still very crisp. Web pages, email, and games look stunning nonetheless and text renders as nicely as anything we’ve seen in 800×480 resolution. The screen itself is responsive, registering taps, swipes, pinches, and the other stuff one does with their finger. We tried Swype, Swiftke,and the standard keyboard, and came away feeling satisfied with the results. The Gorilla Glass protection has a somewhat indestructible feel to it; typical pocket activity and daily carrying hasn’t resulted in any scratches or nicks. As many of you know, the Samsung Galaxy S II runs Gingerbread (Android 2.3.5) with Samsung’s TouchWiz 4.0 user interface. Although handsets tend to lose cool points whenver they run anything but stock Android, the TouchWiz experience is better today than it was just one year ago. The aesthetics are very nice and no longer look as alien as it once did, blending into Android much smoother. Customizing the home screen is very easy thanks to seven panels, resizable widgets, and other nifty features. 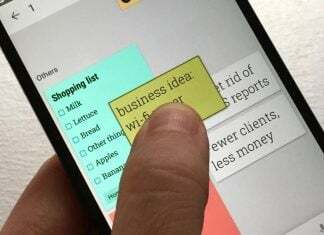 Additional items like simple screen capture, an integrated task manager, and a helpful drop-down notification panel also add to the overall value. Speaking as an existing Android user, one complaint we had was the loading of so many T-Mobile apps and services. Often called bloatware, there’s no mistaking which carrier this model belongs with. If we could, we’d hide as many of these as possible, however new users may love the 411 & More, Bonus Apps, More for Me, My Device, T-Mobile Name, T-Mobile TV, and other apps. Although we couldn’t remove these titles, we quickly hid them with a custom launcher. This is not to suggest there is no value in Netflix, TeleNav, and Asphalt 6 as these are three we’d ultimately download on our own anyhow. Moreover, we’re glad to see T-Mobile has skipped on loading a feature-length movie this time around. I simply adore the camera on the Galaxy S II. Picture quality is superb, even in less than perfect conditions. Recording video in 1080 HD also looks great, especially when shared across DLNA or an HDMI adapter. Thanks to 16GB of internal storage and the potential for an additional 32GB, there’s no excuse or shortage of space for breaking out the camera on a regular basis. 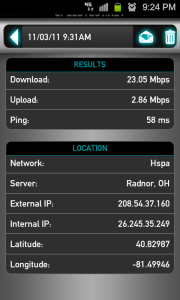 I tested the Galaxy S II in Canton, Ohio and the surrounding areas, taking advantage of the T-Mobile 4G network. I routinely found that the handset would grab speeds of 15Mbps or higher, often topping out over 21Mbps. 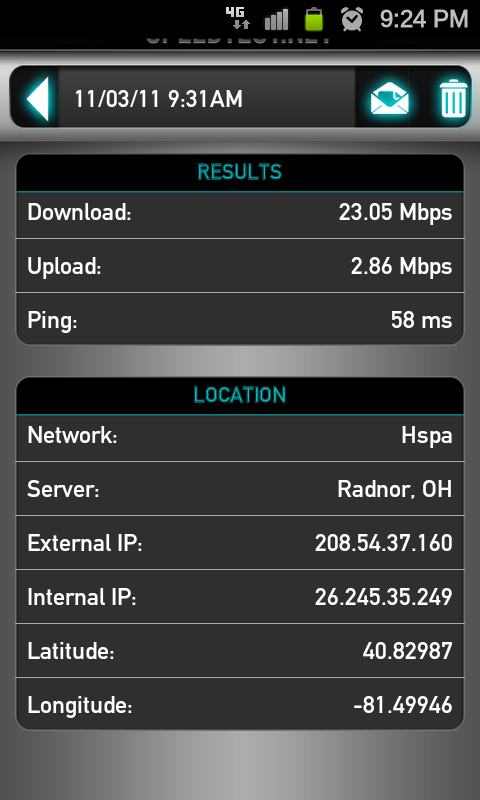 My fastest download test resulted in 23.05Mbps, considerably faster than anything I’ve seen on any other phone today. To think that this is almost twice as fast as my current home connection, this is impressive to say the least. Call quality is as good as I would expect, if only occasionally a tad bit on the tinny side. Pairing over various Bluetooth speakers and headsets proved to be no problem and sound quality was right in line with other models. Without a doubt, the Galaxy S II is one of the top Android phones on the market, if not T-Mobile’s best overall. There’s something to offer users across the entire spectrum – new smartphone buyers or seasoned vets. If you’re a high-end hardware enthusiast looking to replace an existing Android then this handset should appeal to you. The same should be said for consumers buying their first smartphone as the TouchWiz UI makes for an easy-to-learn experience. If you can justify spending the extra money, you’ll be seriously impressed with the Galaxy S II. For those who can’t really afford to spend more than $200 for a smartphone, I would still recommend looking on Amazon or Wirefly for this model. Catch it on the right day and you’ll be truly pleased.